Ok, so the first Starcraft is all about corrupt Terran forces (the humans) killing each other in the name of harvesting resources from other planets. So the criminals create mechs and other toys to do battle for control. There is always a ruling class, here the Confederency founded by criminals. Arcturus Mengsk creates a type of gurilla/terrorist group to overthrow this government. Our main man Raynor joins forces because he didn't like being arrested for shooting up an infested terran command center. Enter the Zerg who are a formabile force and the Terrans are badly weakened. Arcturus Mengsk uses the Psi emitters to draw the Zerg to planets like a terrorist weapon to wipe out the opposing Terran forces of the Confederacy. The Protoss are the garbage men of the universe and totally Ion Cannon the planets with the gathering Zerg, causing human causalties in the process.Raynor starts to feel upset about using the Zerg for genocide and sees Mengsk leave his girlfriend Kerrigan behind on a planet to die. Raynor says "Oh no you didn't" and leaves Mengsk. Arcturus Mengsk becomes the new ruler and keeps the status quo of corruption. Fast forward to the Zerg campaign where Kerrigan becomes uber powerful and infested. She does major work on behalf of the Zerg Overmind, who ends up discovering the Protross homeworld and decides to stop by for a visit. The Overmind embeds itself to the surface like the video to this page. The Protoss discover dark energy is the only way to destroy Zerg Cerebrates (the commanding officers). The Protoss leaders defy their Conclave's (Ruling Leadership Body) as well as their religion by seeking out the Dark Protoss on behalf of the honorable Tassadar. Tassadar is one of the few Protoss who understands the Zerg will wipe their race out unless quick action is taken. Instead, the Protoss race bickers with itself and totally needs additional pylons. Tassadar leads the group, including the now allied Raynor, to the Dark Protoss area and becomes further enlightened. Skipping ahead beyond the Protoss civil war, Tassadar and Co. discover if they kill enough Cerebrates with their dark energy, then they temporarly disrupt the Overminds control. During this time, Tassadar infuses his giant ship with dark energy and suicide rams the Overmind. The Overmind totally gets knifed in the back and disolves into a void in the sky, effectively dead. The Protoss world is a mess from the battle and everyone is going to rebuild. 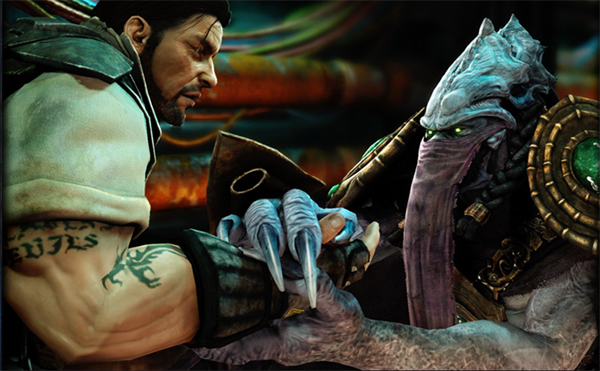 Kerrigan disappears and Raynor still feels guilt. The story basically ends without much celebration and the expansion pack Brood War is filled with tons of deception by Kerrigan and Duran. I turned down an early copy of Starcraft 2 because I am crazy and don't want to spend all morning playing the game when I have other responsibilities. Fear not as I will pick up the game Tuesday evening and am especially looking forward to the single player and custom map settings online. I can't wait for all my favorite Starcraft 1 custom map types to be updated with new graphics and gameplay complexity. Starcraft 2, here I come!